We could all die any day. I’d rather dance my life away. This has been a difficult 26 hours. I have alternated between crying on the couch, staring catatonically at the wall, and pretending that it didn’t happen. I have never been alive, never known a world without Prince—today is the first day without him in my life, and fittingly, the sky is grey and cloudy. Writing is how I cope with grief, with emotion, so today I am writing. Much of what I write won’t make sense, will be a collection of gibberish and anecdote, but please forgive me for that, today. Earlier this week, I wrote about mortality and legacy; yesterday, that message resonated hard. It’s not just hard to face our own mortality, but especially hard to face the mortality of those we love. 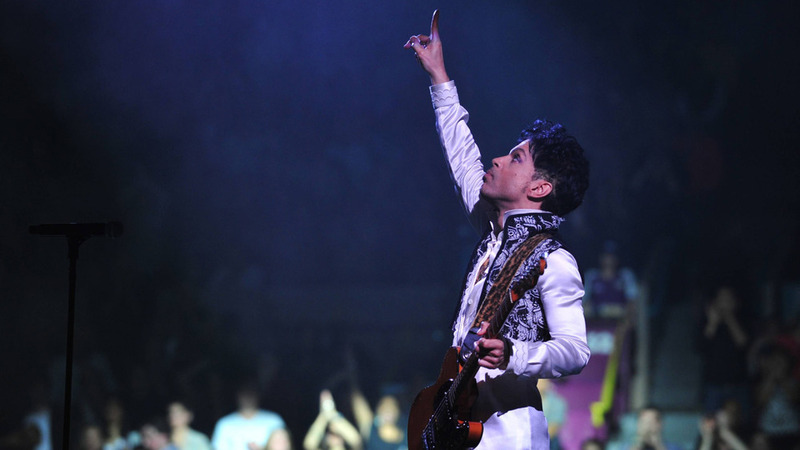 I knew, one day, I would have to deal with Prince’s death—though it was easy to see him as transcendent, immortal—but I was under the impression that that day was still two or three decades away. Instead, we mourn. We weep, we reminisce, we celebrate. And we listen to the music that changed our lives. The first song Nathan played at our wedding, once the jazz duo had left and the speeches were done, was 7. We didn’t ask him to play that, but he did because he knew just how much that song resonated with me; throughout the night, he played three other songs by Prince, always at the right time. What Nathan didn’t know is that of all of Prince’s songs, 7 is the one where I’m always left with wonder and awe. It is a piece of music like nothing I have ever heard before, nothing I have ever heard since. I was already a fan of Prince’s years before 7 was released, but that day I heard 7, when I was just ten years old, I knew that this song, this artist, was something special. I still have no idea what it is about, but I know that when I listen to it, I think of possibility, I think of wonder. It was the perfect first song to play at our wedding, because that day was a day full of possibility and wonder. It was a day that was nothing like any day before, and nothing like any day since. The first and only time I had an opportunity to have a conversation with Prince, I was dumbstruck. I had no idea what to say, no idea how to react. He was sitting there, listening to a band play, and I noticed him from afar. Nobody was bothering him, and I didn’t want to be that person that interrupted his quiet afternoon. But yet, I couldn’t not say hello. He was gracious. He asked me my name, asked me if I came here often. I thanked him for his music, for his impact on my life. He smiled his little half-smile and told me that he just loved making music. I mumbled out another “thank you” before I let him be. That day was over a decade ago, yet I remember it clearly today. I remember not knowing what to say, not knowing how to react. I remember not telling anyone about our encounter for a few days because I didn’t want anyone else to take that memory from me, as if articulating it would steal it away. Over the course of yesterday, I received dozens of messages, emails, phone calls asking if I was okay. I am thankful for everyone who took the time to reach out, to check in, to express their sympathy at the loss of someone they knew was close to my heart. I received a slew of messages from A, a woman in East Africa whom I hadn’t heard anything from in years. A had moved to Toronto as a teenager, from East Africa in the mid-1990s, and even at my young age, I was smitten. I showed her around town that spring, that summer, and when I got tickets to the Prince show at The Warehouse, I knew I would take her with me. She didn’t know who Prince was, and so I made her mix CDs as listening homework before the show. By the time the concert came around, A could sing along to a few of the songs. I was fifteen years old, at a concert with a gorgeous girl, watching my favorite artist play songs that had already become part of the soundtrack of my life. It was a magical night. We drifted apart after the summer, and stayed in touch only sporadically until she moved back to East Africa some years later. Yesterday, she messaged me, after years of silence, checking in to see how I was doing, and to say thank you. And I reminisced, remembered. Before my freshman year at Georgetown, I got to Washington DC a few weeks early, before orientation, to have some time to explore the city. In those few weeks, I met K, an international student starting her freshman year at GWU, and we became friendly, quickly. We spent a lot of time together those first few weeks, but once our respective orientation weeks were over, we drifted apart, only checking in on each other via AIM every four or five days. Late into our first semester, a few weeks before the Christmas break, K disappeared. She stopped logging in to AIM, and didn’t respond to my emails. I asked a friend of hers about her absence, who informed me that K had developed the flu, and it had gotten bad. She had returned to her home in the Caribbean a few weeks before Christmas so that she could heal and get care close to her family. I sent her a mix CD filled with songs that we had listened to, over and over again, in our first few weeks together. (Naturally, at least a third of the songs were by Prince.) I never did find out if she received the CD. When I returned to school that January, her friend informed me that K had passed away from complications from the flu. I say I have no regrets because all the decisions I have made in my life have led me to who I am, where I am now: married to the most wonderful and beautiful woman I have ever known, building a career where my work makes tangible and positive impact on the world, and living a life where my main goal is to make someone smile, every single day. But I do have regret, now. When Prince announced, just a few weeks ago, that he was coming to Toronto for the A Piano and A Microphone tour, when all my friends bought tickets and my brother offered to buy me one as well, I declined. I said no because I was tired, because I wanted to go home to London after a long week in Toronto. I decided to skip the concert because I had seen Prince perform so many times, and I knew that I would get the chance to see him so many more times in the years to come. I was wrong. There are no more chances to see him perform live. We live with our regrets. And we live with our sorrow, our loss. We mourn, we weep, we erupt into tears on the sidewalk. And then we celebrate. We remember, we reminisce. We build ourselves up on music and memories. And then, between tears, we dance. Because that’s what he would have wanted us to do.